← Angry at country club Democrats for tax cuts for the rich? Write Congress! For those of you unfamiliar with the history of World War II, Neville Chamberlain was the prime minister of Great Britain just prior to the advent of World War II. He is most remembered for his “Munich Agreement”, in which he deeded over Czechoslovakia to Nazi Germany with Germany’s promise that it would not pursue further aggression. Of course, this was making a deal with the devil; Adolf Hitler was Satan incarnate, for certain. Consequently, his name has become the emodiment of appeasement and naivete, if not utter stupidity and idiocy. You cannot make a deal with the devil. Shown here in the picture to the right is Neville Chamberlin upon his return from Munich in 1938 after meeting with Adolf Hitler with the scrap of paper that was to “ensure peace in our time”; the paper was signed by Hitler. 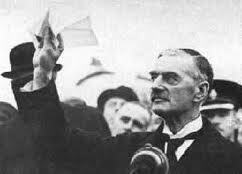 The question now is whether Barack Obama is another Neville Chamberlain. Obama is supporting the tax cuts for the rich, claiming that unless we agree to these demands by the Republicans, our economy may dip back into recession, as Chamberlain asserted that unless England and Europe gave Nazi Germany Czechoslovakia, that a war with Germany might occur. Whether you are for the tax cuts or against the tax cuts, the majority of Americans were surprised, if not flabbergasted, by Obama’s immediate capitulation to Republican demands for inclusion of the rich in the tax cuts, including a very generous exemption from estate taxes: under the plan, as much as $10 million may be exempt from any estate tax, with the estate tax rate on any excess being reduced from 55% to 35%! Certainly, Barack Obama is no Winston Churchill. Perhaps he restricts his fighting to the basketball court, where he recently incurred an injury requiring 18 stitches, because he certainly did not fight the good fight before conceding to the Republican demands, merely accepting in return a 13 month extension of unemployment benefits for 2 million Americans, a reduction in payroll taxes, and an extension of a grab bag of tax credits for college tuition and other items. Like Chamberlain, who only received Hilter’s signature on a scrap of paper promising never to go to war again with England, Obama got very little in return for his big giveaways to the rich and privileged. A recent CBS poll found 70% of Americans were not in favor of these tax cuts for the rich—resulting in huge deficits of $700 billion dollars—when our national debt is already $14 trillion. Many feel that no tax cuts would have been preferable to this agreement, since no deal would spare us from an additional $980 billion of debt. After hearing the endorsement of these tax cuts for the rich by Harvard’s Larry Summers, and his prediction of another recession if they are not enacted, I suspect that President Obama may still be listening to the counsel of his former Economic Advisor. What do you expect from an educator of America’s elite class? An endorsement of a government of the unprivileged, by the unprivileged, and for the unprivileged? Is anyone surprised to hear Summers’ talking points uttered by Obama, knowing that Summers advised Obama on his economic policies in his first two years as President? Does Paul Winchell and Knucklehead Smiff ring a bell? If appeasement best characterizes Obama’s approach to negotiations with the Republicans over tax cuts for the rich, can you imagine the results of his negotiations with the Iranians and North Korea over nuclear weapons? 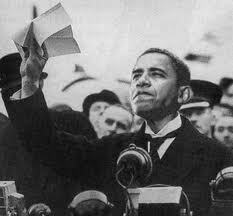 To paraphrase one of the greatest Yankees of all time, Yogi Berra: deja vu Neville Chamberlain all over again? This entry was posted in Accountants CPA Hartford, Articles and tagged extension of Bush tax cuts, Is Obama another Neville Chamberlain, rich tax cuts. Bookmark the permalink.